How Long Can You Keep Butter Unrefrigerated? Does Whipped Butter Have to Be Refrigerated? Is Homemade Butter Better Than Store-Bought? What Is the Highest Quality Butter for Baking? You should keep butter whipped with water in the refrigerator. 1 How Long Can You Keep Butter Unrefrigerated? 3 Does Whipped Butter Have to Be Refrigerated? 4 Is Homemade Butter Better Than Store-Bought? Whipped butter makes for a softer, easier spread. 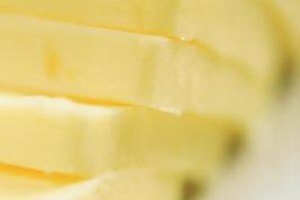 When mixed with air, the butter can increase in volume by as much as a third, yet it still may contain 80 percent butterfat. Adding cold water makes the whipped butter even smoother and adds additional volume. It also creates a lighter butter. Usually, ice water works best when whipping, as it keeps the butter cool during mixing. A large bowl and a whisk is all you need to make homemade whipped butter. A food mixer makes the process even faster. The National Dairy Council suggests creaming softened butter in a food processor, pulsing at low speed. Eventually, the butter will turn light and fluffy, as the air is trapped inside. Adding cold water to whipped butter involves slowly mixing one half cup of iced water to the whipped butter and continuing to whip, until it fluffs up. Adding cold water to whipped butter gives a smoother finish. However, because the water is released as the butter warms up, it is not suitable for spreading on hot toast, for example. Instead, it's perfect for cold bread rolls. Because the density of whipped butter is different from standard butter, you should not use it in baking or cooking recipes, as the measurements will be inaccurate. It also melts too fast and froths too much for frying. Making butter at home from heavy cream can also require cold water. After mixing the cream slowly, it will form clumps of butter granules. Once you drain off the buttermilk, some recipes suggest that you combine the butter with ice-cold water and mix firmly. This helps rinse off more buttermilk, leaving a pure butter. Once finished, you can make this into whipped butter by whisking vigorously. Whipped butter generally goes rancid more quickly than standard butter. Whipped butter mixed with cold water is even more unstable, and won't keep in the refrigerator as long as a solid butter pack. If you make whipped butter with water, do so shortly before use. When it comes to whipped butter, the fresher the better. Can You Cook With Cream Cheese Instead of Butter? Does Butter Harden After It's Melted? What to Do If My Buttercream Frosting Turned to Butter? Can I Use Melted Margarine in Cake Mix Instead of Oil?